1930&#039;s Wilson &#034;Bill Terry Deluxe&#034; base mitt in near mint condtion. 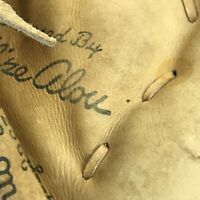 Details about 1930's Wilson "Bill Terry Deluxe" base mitt in near mint condtion. 1930's Wilson "Bill Terry Deluxe" base mitt in near mint condtion.